The Park of the Castle of Tronjoly is a bosky bower in the middle of which nestles a castle of the eighteenth century, built on the ruins of an old country house. 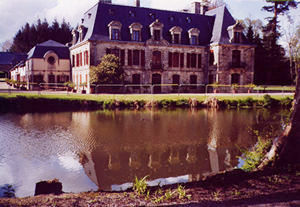 This beautiful building is reflected in the waters of an old millpond. Just near the castle, an open air theatre has been built. To walk through the park, visitors can take the laid out lanes, the bridges spanning picturesque brooks and numerous paths. The park presents magnificent several hundred-year-old trees: their names and the place they come from are indicated.